Renowned for its antiseptic properties, Hydrogen Peroxide is a simple solution of water with an additional oxygen atom, this changes the chemical structure from H2o (water) to H2O2 (Hydrogen Peroxide). There are many natural health remedies that make use of this simple yet effective substance, largely due to its powerful oxidative properties which are known to kill bacteria, remove stains and even help to oxygenate our bodies! Can Hydrogen Peroxide Replace My Regular Mouthwash? 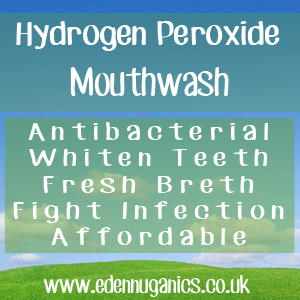 A very popular use for food grade hydrogen peroxide is as a flavour free antibacterial mouthwash. Simply add 3% H2O2 to your mouth and swill for around 3 minutes. There will be a strong fizzing sensation; this happens when the additional oxygen atom found in hydrogen peroxide is released and is a sign that the mouthwash is working. Not only will this help to leave your whole mouth free from bacteria, but is also thought to help clean and whiten teeth. Make sure you have bought (or diluted down to) 3% hydrogen peroxide or less. This is very important as very high concentrations are known to be corrosive and can cause burning when used orally and could also damage tooth enamel. Next, simply swill in the mouth and spit out after a few minutes, do not worry if a small amount is accidentally swallowed as hydrogen peroxide can be used internally at these low concentrations as a way of adding extra oxygen to the body. Although many people use this daily, we recommend using this remedy once a week for general maintenance and more often when treating infections or other issues. Although recently in the UK the sale of 35% Peroxide has been banned for those who don't possess a license, there will still no doubt be many of you at home with bottles of H2o2 in this concentration. To dilute this to make it safe for oral use you will need to make a solution of 1 part hydrogen peroxide to 11 parts distilled water. Essential Oil Mouthwash - One of my favourite uses for essential oils is to include them in this great tasting mouthwash recipe. The best ratio is to add around 20 drops of essential oils to 1 cup of filtered water. Some of the best oils to include are tea tree, lemon oil, rose, clove and cinnamon. Then just swill it around in your mouth in the usual manner before spitting it out. Coconut Oil - At this stage, you may have already heard of the term 'Oil pulling' this ancient Ayurvedic technique involves swilling coconut or sesame oil in the mouth for around 20 minutes at the start of each day. There are a list of health benefits from carrying out this practice daily, not least having a healthier mouth, and whiter, healthier teeth. The last year or so has seen this almost forgotten practice go from a few surviving practitioners to almost mainstream status with endorsements from celebrities and health gurus around the world.